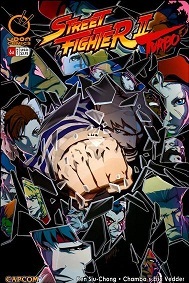 Udon Entertainment have been releasing Street Fighter comics since 2003. Some Final Fight characters have appeared in them, as either part of the main story or as back up stories. The main issue Final Fight wise would be the May 2009 one, which is part of the Street Fighter II Turbo series. 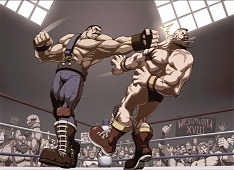 Some of the main Street Fighter characters -including Ryu and Guile -have to qualify for the main tournament by fighting in a smaller one, set in Metro City. Cody, Rolento, Hugo and Poison all take part in this tournament -although Cody had to escape from prison to join up. The fights aren't very long. Cody and Poison battle each other, and Cody seems to win. But Poison recovers and manages to get Cody stuck in an elevator, which takes him up to the top floor. Just as Poison takes her ticket for the tournament finals, she is attacked from behind by T. Hawk and knocked out by his thunder strike move. Rolento is attacked by Birdie, but quickly fends him off. But in another attacked from behind moment, Guile appears and manages to pull the pins on Rolento's grenades. Rolento gets them off, but is knocked out by the resulting explosion. Hugo faces Ken. Ken tries his hadouken, but it doesn't work, and Hugo just keeps moving forward. 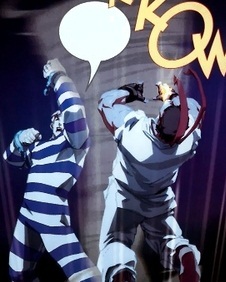 Hugo grabs Ken and starts to choke him, but Ken escapes from his grasp and knocks him out with a shoryuken. Finally, at the top of the building the fights are taking place in, Cody meets Ryu. Cody starts to fight with him, saying he has an advantage as he's used to fighting 8 people at once. He knocks Ryu back with his criminal uppercut move. This causes Ryu to fall under the influence of the dark hadou, and he lands several powerful hits on Cody which knock him out. But he snaps out of it just in time to stop himself from killing his opponent. Ryu takes Cody back to the bottom of the building, seconds before it explodes due to some bombs Balrog had setup. The Mad Gear members are also shown to have escaped. Earlier in the series there was another story with another tournament qualification event, where Sodom appears. His opponents is R. Mika, who he defeats, but he is then defeated by Zangief. As mentioned above, some of the backup stories feature Final Fight characters. I know there is one featuring Haggar fighting Zangief, and another one where Maki confronts Guy. I haven't read these but some of the pages for the Maki Vs. Guy story can be unlocked in the vault featured in Final Fight Double Impact.